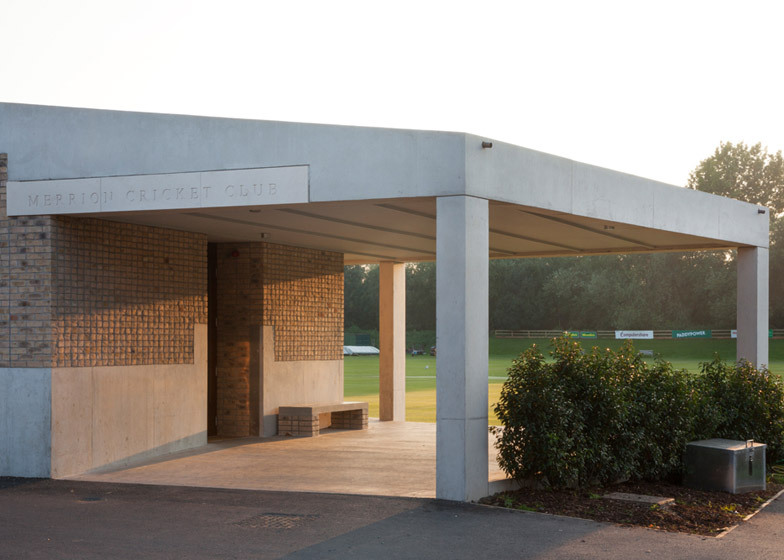 An angular black roof rests on the concrete and brick walls of this pavilion that architecture studio TAKA designed for a cricket club in Dublin (+ slideshow). 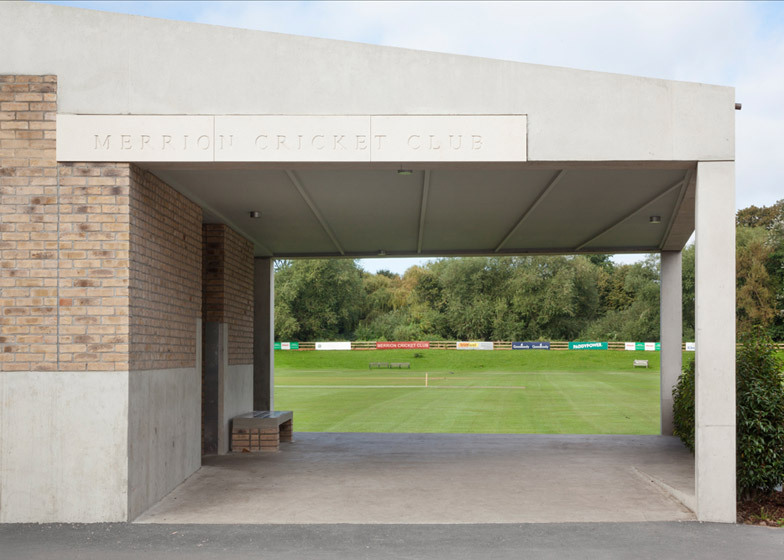 Dublin-based TAKA designed the single-storey pavilion with a cafe, bar and loft apartment for the Merrion Cricket Club. 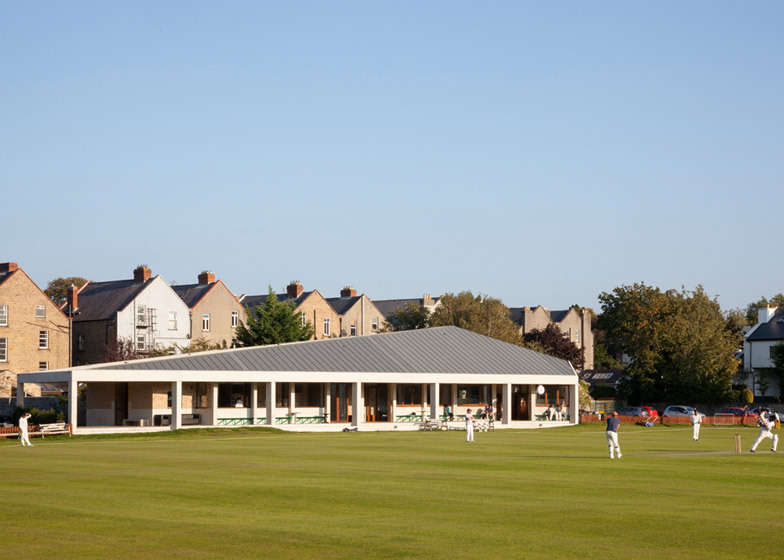 The site, in use by the Irish club since 1906, is tucked behind period brick houses and faces towards the capital's River Dodder. 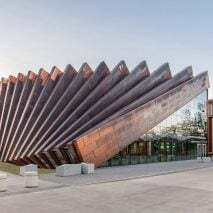 The architects designed a brick and concrete structure to replace an existing 1980s pavilion damaged by flooding four years ago. 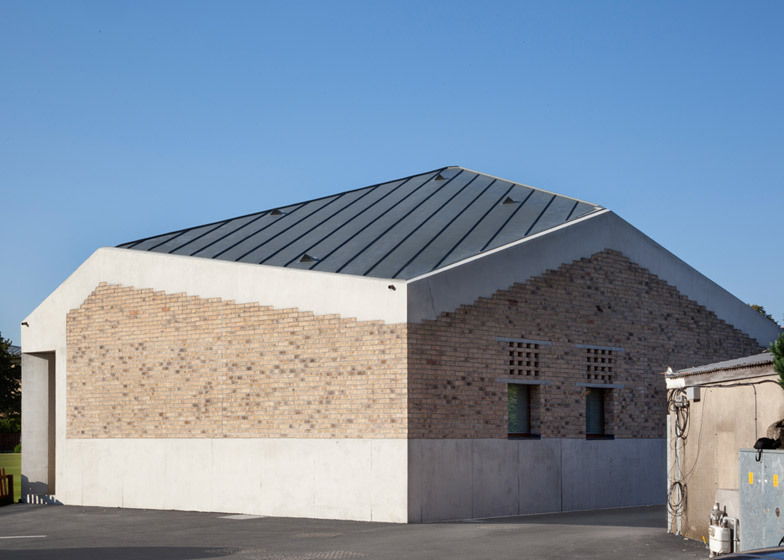 A faceted roof tops the building, which is made up of two simple rectangular volumes. 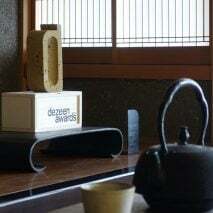 The two blocks, set at an angle to each other, follow the same footprint as their predecessor. 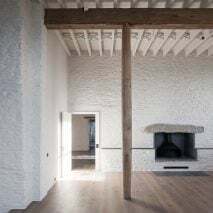 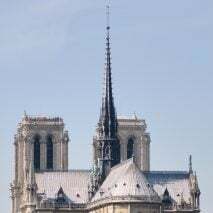 "Although the form of the new building appears from certain vantage points to be highly irregular, it is in fact a symmetrical pyramidal volume cut to fit the irregular geometry of the site," said the architects, whose past projects include a mews house with protruding brickwork. 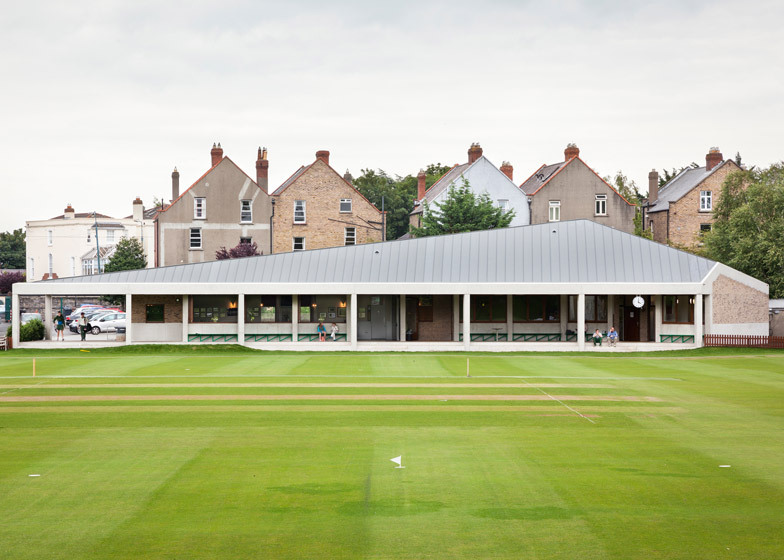 The pavilion is equipped with a number of cricket-ball-proofing devices. 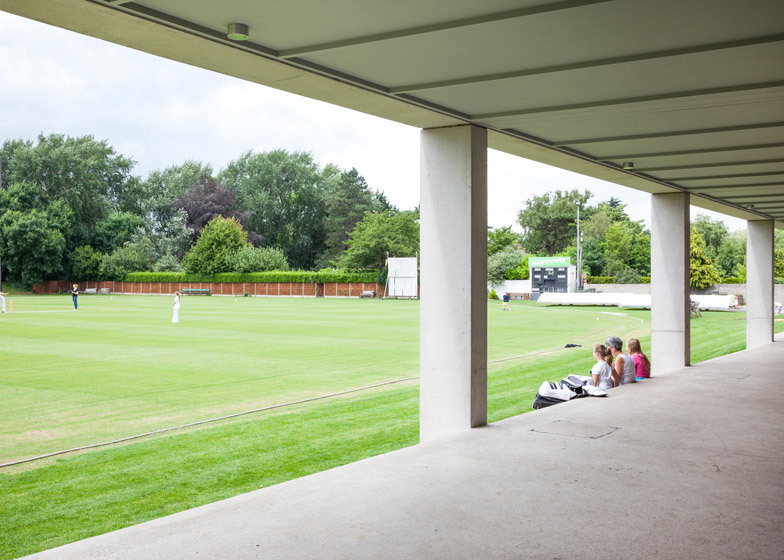 These include glazed windows and doors that slide to one side during matches to decrease the annual cost of replacing broken window panes "as a result of stray cricket balls", and recessed guttering with mesh inserts that "ensure costly cricket balls are not trapped at high level". 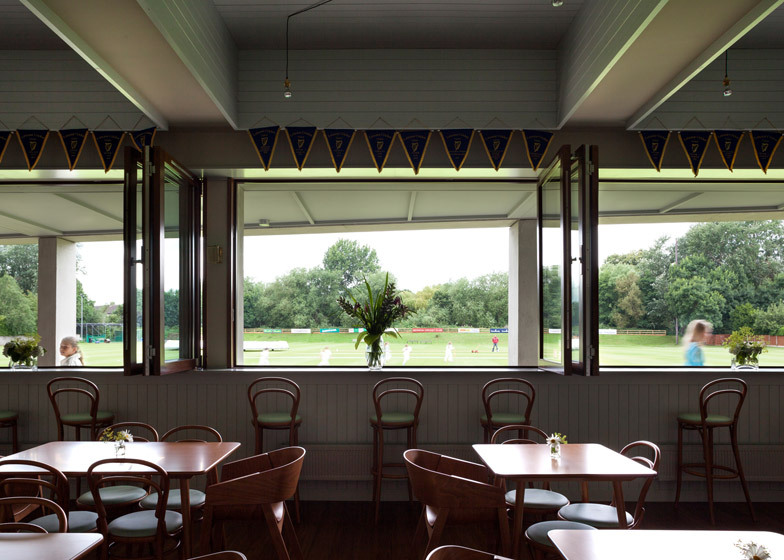 The lower floor is given over to a bar and tea room for the public, and changing and physiotherapy rooms for the cricketers. 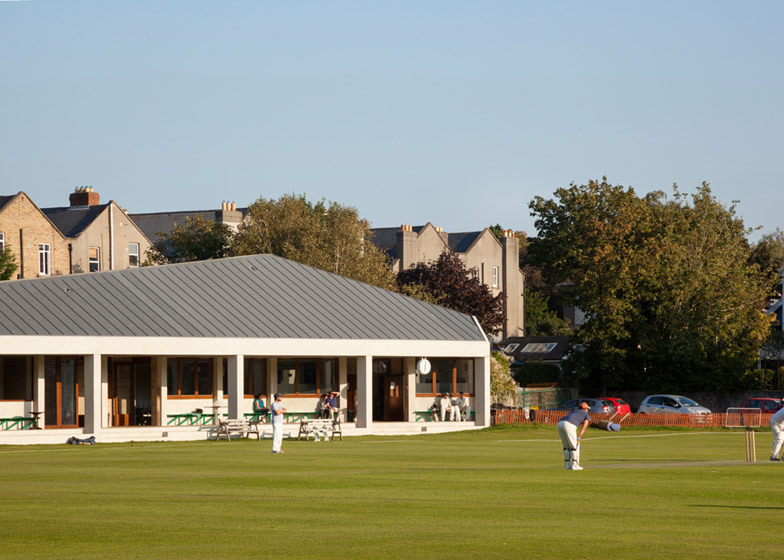 There is also an apartment housed under the large pitched roof structure, creating a home for one club member. 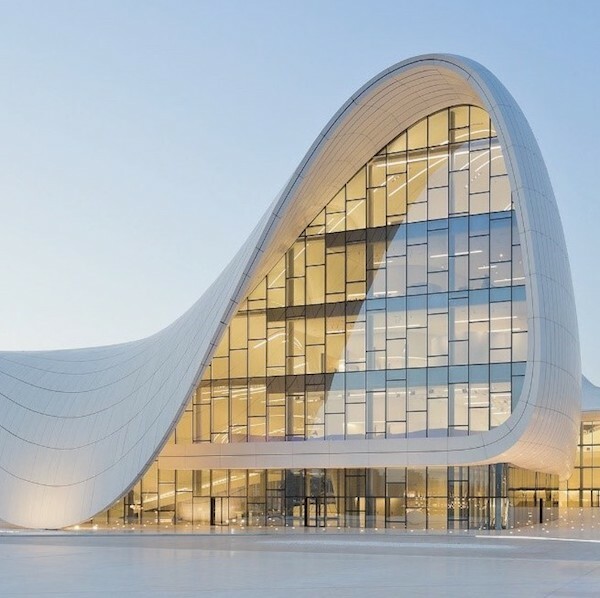 "The distorted roof accommodates the multiple requirements of the programme while recalling a singular pavilion building," added the architects. 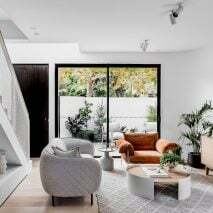 The building is raised on three steps above the playing field and has a waterproof concrete wainscoting up to the windowsill level that aims to prevent the risk of future flooding. 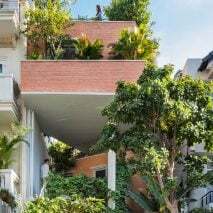 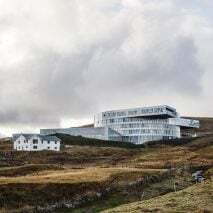 The roof overhangs a colonnade that surrounds the building to create a viewing terrace. 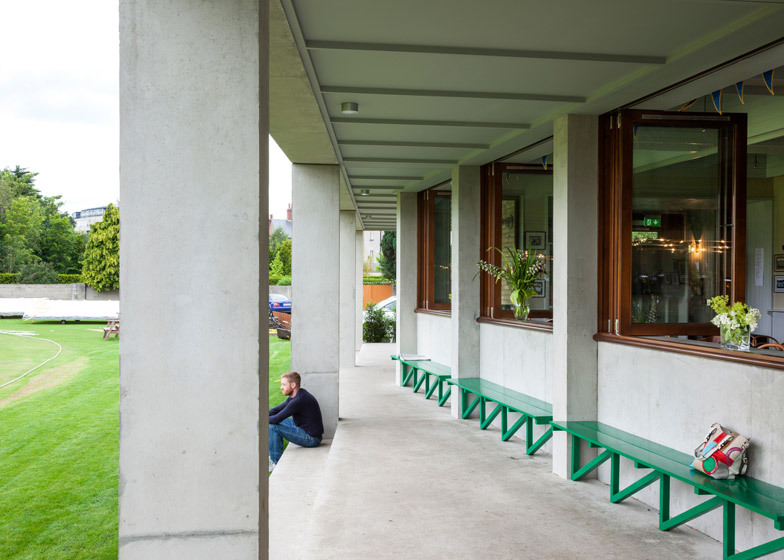 Green painted benches with zigzagging legs are positioned in the gaps between the concrete columns that support the roof structure. 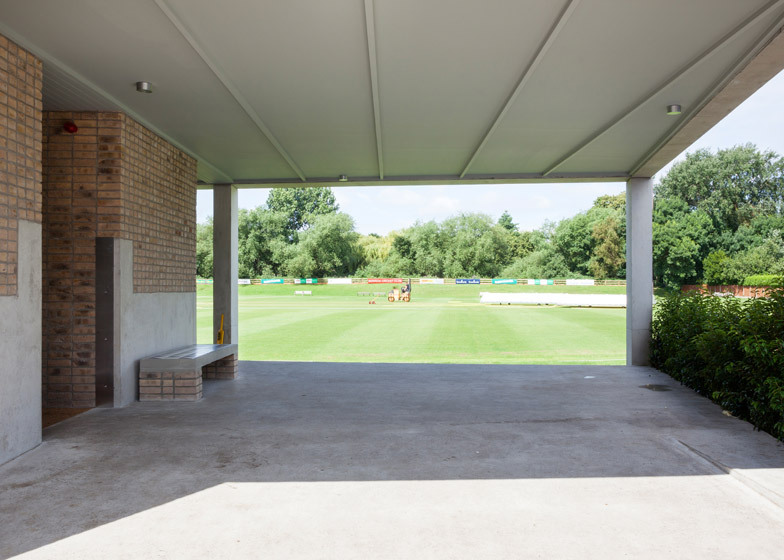 Three concrete steps leading down onto the pitch provide an informal seating area for spectators. 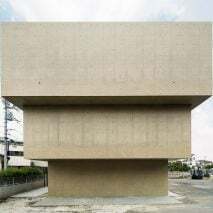 "The delicate diagonally-braced bench supports serve to visually contrast with the heaviness of the concrete structure," added the architects. 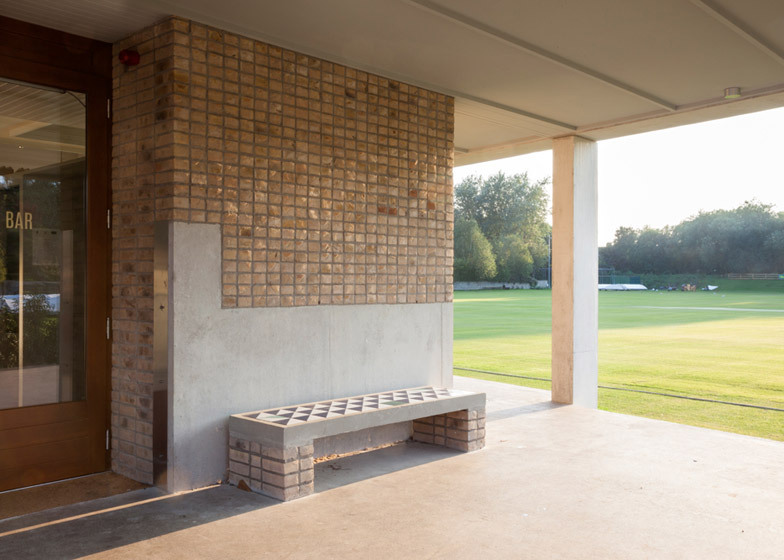 Under the entrance portico at one end of the building, a concrete bench inlaid with colourful triangular tiles sits on stacks of red brick. 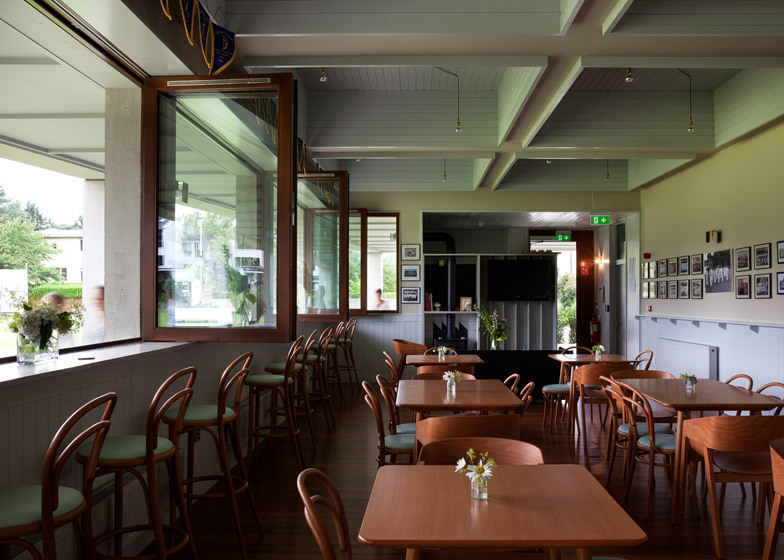 The walls of the bar area have been painted with summery shades of pale blue and green that contrast the dark wood floors, furniture and window frames. 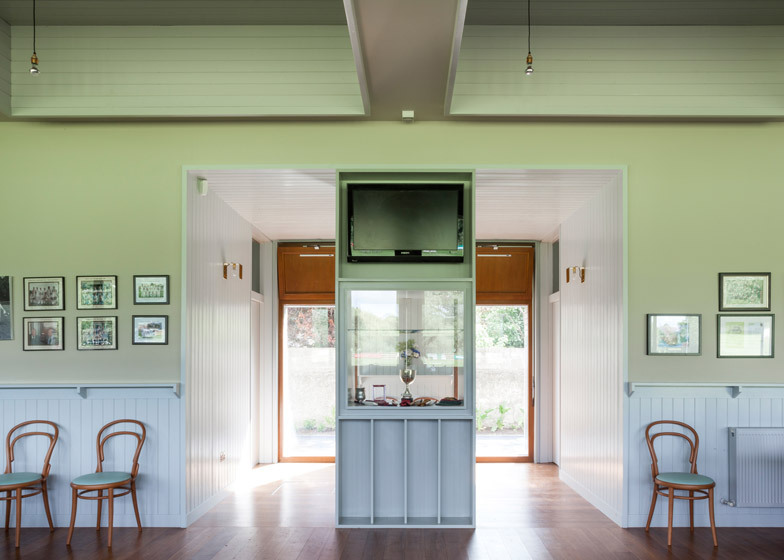 Sections of wood panelling just over a metre high run around the room at "the ideal height to lean against while viewing cricket or sipping a drink." 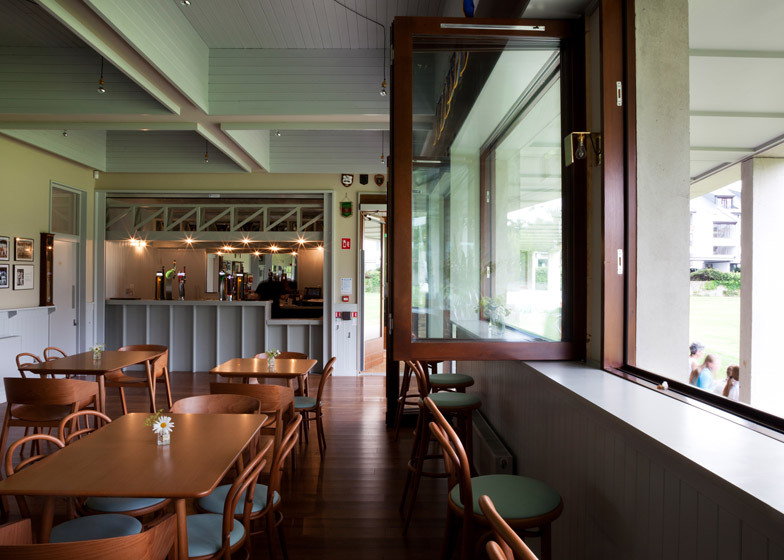 High stools with dark green seats sit along a wooden counter positioned against large windows facing the green. 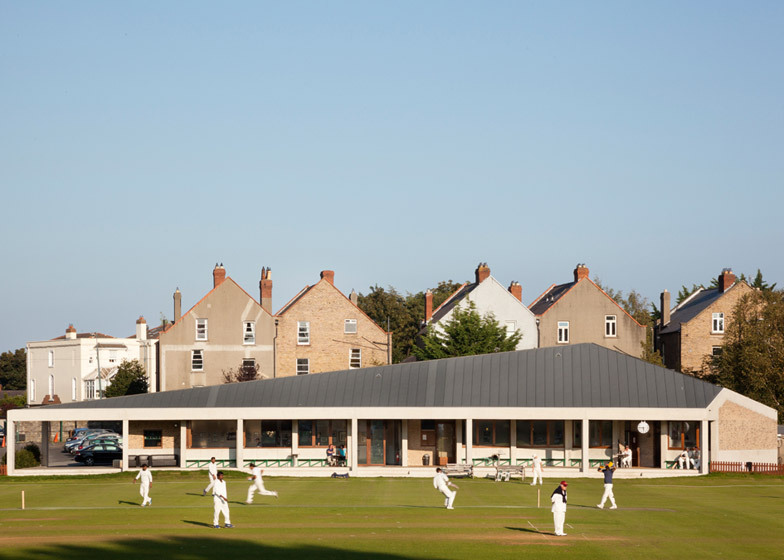 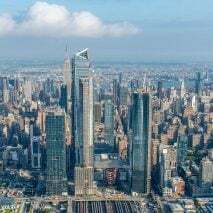 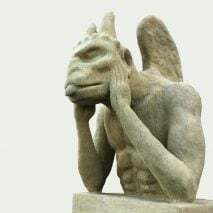 "Particular attention has been paid to the area between the bar windows, the viewing terrace and the cricket pitch beyond to allow for multiple, simultaneous viewing opportunities," said the architects. 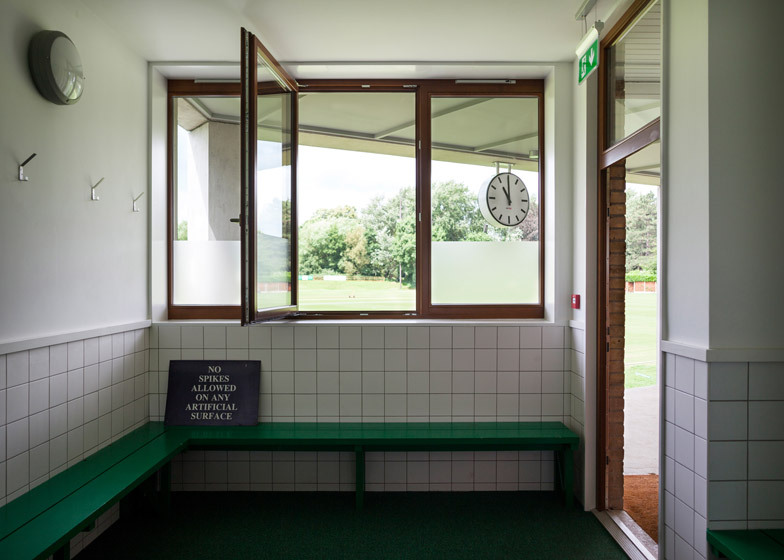 The "home" and "away" changing facilities, with tiled walls and green benches, are positioned in the second part of the building that angles away from the main socialising space of the clubhouse.